What is Weathered Teak Furniture? 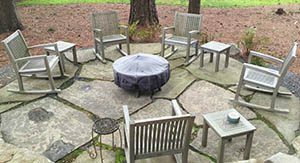 When looking for outdoor furniture, many customers prefer weathered teak furniture. This has the vintage look of older furniture. In teak furniture, the weathering is a natural process that happens over time. Premium outdoor teak furniture will turn gray and have a beautiful gray/silver patina after a few seasons outdoors. In Atlanta, you can expect your outdoor teak furniture to be fully gray in about 1 year, plus or minus a few months based on the environment. What causes the teak to weather? The weathering or graying of teak furniture is caused by the sun’s UV light, wind and other elements. Premium teak furniture is dark brown throughout the wood. The graying only happens on the surface. And while this weathering may be a sign of deterioration in other types of wood, in grade-A teak it is purely cosmetic. Premium, grade-A teakwood that has turned gray will still last a very long time. Be careful to avoid pre- weathered teak furniture. Some stores will sell pre-weathered teak furniture. In this case, the manufacturer has applied chemicals and washes to the wood to color or dye the surface of the product. This is harmful to the natural wood and unnecessary. There is no reason to do this. These are the same stores that sell teak furniture with different finishes – even though premium teak should always be sold unfinished. They are doing this to hide poor quality raw materials and imperfections. Learn more about how to spot quality teak furniture in this article. Grade A teak will turn gray naturally, so with a little patience you can have beautifully weathered teak furniture that will last a lifetime. How do I keep my teak furniture gray/silver? That’s the best part. If you like the gray/silver look of weathered teak furniture, your maintenance is almost zero. Simply wipe down the furniture to keep dirt, pollen, etc. off and you are just fine. Don’t let other debris sit on the furniture for too long, either. You can spot clean any spills or stains with soap and water or sandpaper. Read our other blogs and visit our teak furniture website to learn why teak from Thailand is the best. And, discover how not all teak furniture is created equally.